While many experts are focused on the common cyber and technology risks of today, Goodman adopts a futurist’s approach, looking beyond today’s cyber threats in anticipation of the next generations of criminality. Marc Goodman is a global strategist, author and consultant focused on the disruptive impacts of advanced technology on personal, business and government security – both in the U.S. and abroad. As an exclusive speaker with American Program Bureau, Goodman now is sharing his knowledge, insight and groundbreaking case studies with corporate leaders, security executives, healthcare groups, student groups and government organizations around the world. Over the past twenty years, Goodman has built his expertise in next generation security threats, cyber crime and information warfare, embedding himself within organizations like Interpol, the United Nations, NATO and the U.S. Government. The founder of the Future Crimes Institute, Goodman and his team are dedicated to studying and forecasting the effects of scientific and technological progress on crime, policing and the criminal justice system, which directly impacts the security implemented within the businesses he speaks to. Through his hands on work, Goodman educates audiences on the latest – and future – cyber risks and the means to combat them. While many experts are focused on the common cyber and technology risks of today, Goodman adopts a futurist’s approach, looking beyond today’s cyber threats in anticipation of the next generations of criminality. Some of the biggest changes in technology our world will see, including robotics, artificial intelligence, genetics, synthetic biology, social networking, the internet and more, are difficult to navigate. However, Goodman will instruct and inform businesses and other organizations on how to best capitalize on these trends in order to manage the associated risks they will surely bring. In his unique presentations, he supplies audiences with real world examples of emerging technologies, how they will affect our future and offers customized solutions to help mitigate the growing risks faced by individuals, companies and government organizations. Regarded as one of the preeminent “go-to” experts on the future of cyber security, Goodman is a frequent contributor to many leading news and business publications including Time, Forbes, The Economist and Wired. A familiar personality among today’s corporate and tech leaders, Goodman has also made appearances on CNN and the PBS NewsHour, as well as being a featured speaker at TED, FutureMed, Google Ideas, ITSEF and other prominent industry forums. Organizations wishing to book Mr. Goodman should contact American Program Bureau at 1-617-614-1600 for information on available dates and program topics. For more information on American Program Bureau, please visit http://www.apbspeakers.com. 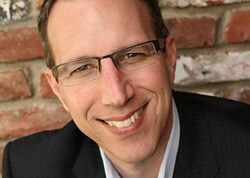 For a profile on Marc Goodman, please visit http://www.apbspeakers.com/speaker/marc-goodman. Founded in 1965, American Program Bureau has long provided a vocal platform for the world’s most forward thinking voices on global strategy, new technology and security applications for business, healthcare and government, including Jared Cohen, Nick Bilton, David Pogue, Rebecca Costa and others. The global leader in the professional speaking industry, APB exclusively represents hundreds of speakers and serves thousands of clients worldwide. Today, APB represents the top thought leaders across the realms of business, technology, government, healthcare and entertainment including Mikhail Gorbachev, Archbishop Desmond Tutu, Rick Belluzzo, Richard Branson, Michael Douglas and many others.